The UK Primary Schools Table Tennis Home International Championships took place over the weekend of 6-8 April at Largs in Scotland. The Home International has events for team of 4 in both boys & girls events, and as well as the 4 nations of Scotland, England, Ireland & Wales, there are teams representing Guernsey, Jersey and the Isle of Man at the Championships. 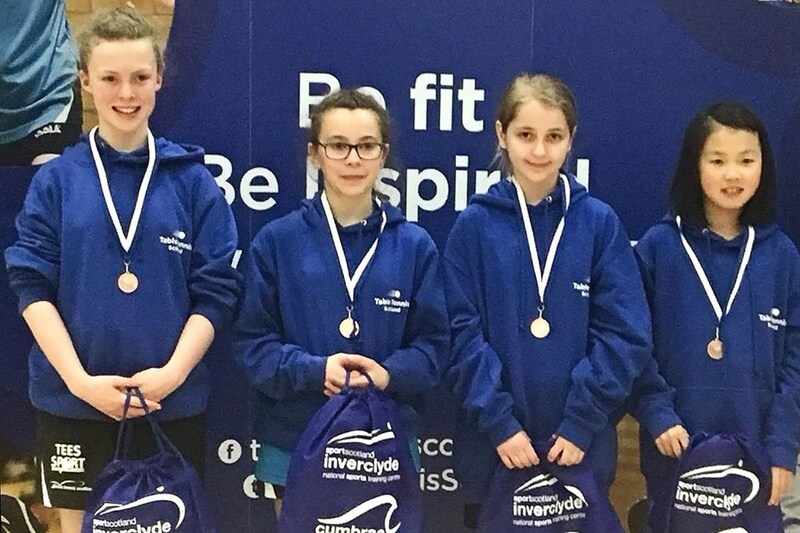 Within the two Scottish teams of 4 players, ASV Table Tennis Academy had 2 girls Hania Petryk (Seaton Primary) and Ilaria Zhou (Sunnybank Primary), and also 2 boys Louis Loi (Turriff Academy), Daniel Tibbetts (Arduthie Primary). This represented 50% of the entire Scottish team from the ASV Academy and is a fantastic achievement for one club. Both teams got off to excellent starts, taking 2 match victories each, and a particularly impressive 10-0 thrashing of Wales by the boys. The boys overcame the rest of the Island teams, however knew there were tougher matches ahead, particularly against England & Ireland. First up was Ireland, and after some very close games, Scotland went down 3-7. 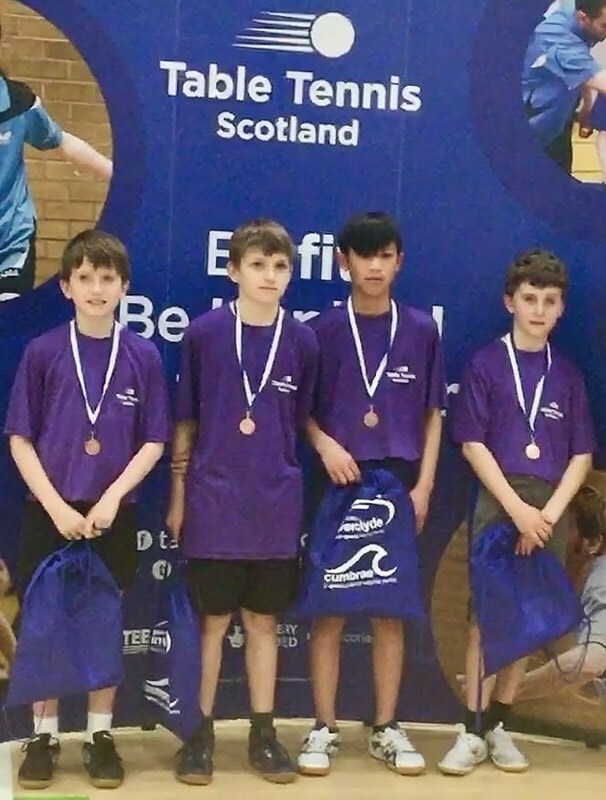 However it is important to note that the 3 games Scotland did achieve in the match came from a win each from Louis & Daniel, as well as the boys teaming up to take a doubles win for the third point. So our boys did what they could in the match, taking over 50% of their particular games. This meant the boys had to defeat the favourites England in their final match to still be in with a slim chance of the Gold Medal. However that wasn't to be and the Scottish boys had to settle for the Team Bronze Medal at the end of the event. Still an excellent result for the team. It was a very similar story for the girls team, defeating all the Island teams and the main challenges coming from England, Ireland & Wales. The match against Wales was an excellent encounter, with the lead changing hands 3 times, before the match finally ending in a 5-5 draw! Hania was involved in 2 wins of the 5, taking a singles win and a doubles win with Amelia Smolareck from Glasgow. Ruby Elliot was the star performer for Wales, winning both her singles matches. Next up was Ireland for the girls, again still with everything to play for and the chance of the Gold Medal still possible. This was another tight match for the girls, and again the lead in the match changed three times before being poised at 4-4. Unfortunately in this case it was Ireland who pushed on and took the last 2 games to run out 4-6 winners. Once again it was Hania who performed well for Scotland, taking an individual win and part of a doubles win with Amelia. This meant the gold medal was out of reach, but with England completing a clean sweep of wins, and Ireland overcoming Wales comfortably, it meant the Scottish girls also took home the Team Bronze Medal, another excellent result! The final day of the Championships sees the singles events, with all players playing open tournament style to determine the UK Primary Schools Champion for both boys & girls. In the singles, Hania continued her good form and improved confidence from the previous days, and made it through to the semi-finals of the girls event. At this stage Hania came up against Welsh No.1 player Ruby Elliot again, who had beaten Hania 0-3 previously in the team event. This turned into the match of the championships, with both girls playing some excellent attacking and consistent table tennis. The first game went against Hania 8-11, but she rallied in the second game taking that 12-10. By the forth end Hania found herself 1-2 down in the match, but again pulled out the stops to take an 11-7 win and square the match at 2-2. After a nail biting deciding game, Hania was very unlucky to be on the wrong side of a 9-11 scoreline. 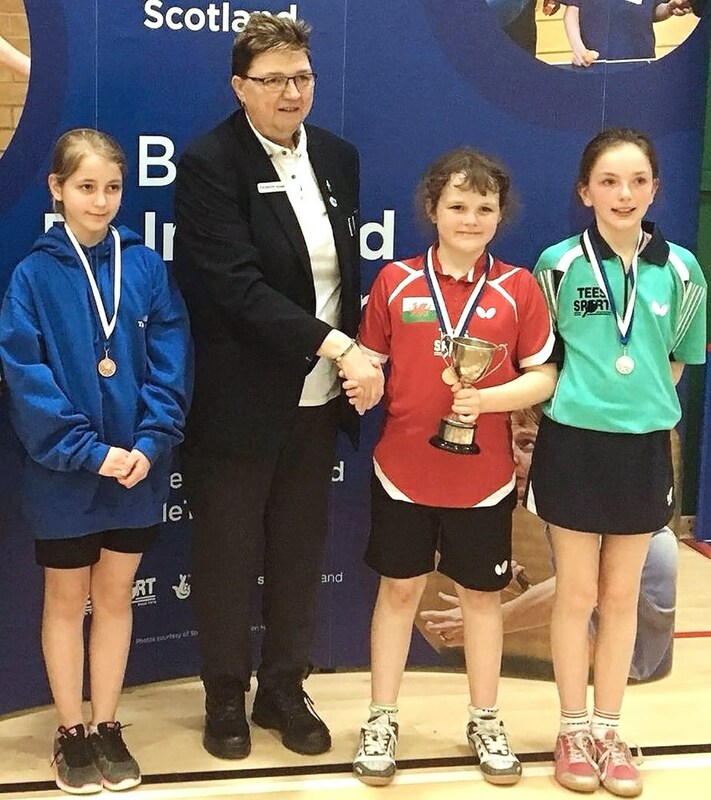 Hania proceeded to collect her second Bronze Medal of the weekend and was the top individual Scottish performer of the event, but can count herself very unlucky not to have made the final, which Ruby Elliot won comfortably 3-0. Louis went through to the quarter-finals of the boys event, but lost out 2-3 to English player Joseph Dennison. Such is the strength of the England squad that 3 of the last 4 were all from the England team. After leading 2-1 in the match, perhaps Louis feels that a semi-final place could have been achieved. Daniel went out unexpectedly in the groups stages of the singles, which meant he was placed into the consolation 'Plate' event. Disappointed by his early exit, Daniel made short work of the Plate event, taking the Gold medal in some style and showing his early exit was simply one bad match. In the end it was a good championships for Scotland, and particularly Hania and the ASV TT Academy players, coming home with 2 team and 2 individual medals.